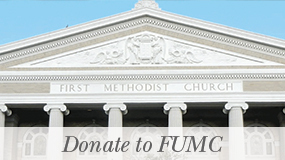 At FUMC, we don’t have a separate worship time for the children. This is a very intentional choice. 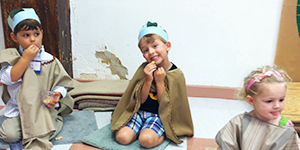 Children are a part of our church family and we share the responsibility for nurturing their spiritual needs. By welcoming them at our church’s most sacred moments, children learn that nothing can separate them from the love of God. By worshiping together with our children, we pass on our traditions for praising God through the sacraments, music, proclaiming and hearing the good news, and offering our gifts and prayers. Children are encouraged to participate in the service as much as they are able, finding hymns and responses, standing and sitting with the rest of the congregation, coming to the chancel area for Time with Young Disciples and learning prayers and responses. We believe that it is important for parents to grow and be fed in their faith as well. For families with infants and toddlers, we know that parents can best worship when their children are safe and happily engaged in our childcare rooms. When children reach about four or five and they are ready, we encourage parents to begin bringing them to one of our worship services on a regular basis. Holy Communion is celebrated every week at the 9:00 a.m. service and on the first Sunday of the month at the 11:00 a.m. service. 9:00 a.m. On the third Sunday of every month, a worship service is offered in our beautiful and intimate Murchison Chapel. 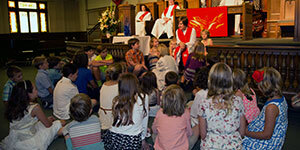 Children are encouraged to engage in our Time with Young Disciples during the 11 a.m. Sanctuary service. This is a great chance for children to get up, move around, and be close to the minister, altar, and others in our congregation. Worship bulletins are available with crayons and scriptural puzzle pages that provide quiet ways to focus energy for preschool and elementary age children, ages 3-11 years. The bulletins can be found on clipboards in baskets by the front doors of the Sanctuary. Children may use them during worship services and then return the crayons and clipboards to the baskets following the service. For parents that wish to remain close to their infants and toddlers while still attending worship, a Family Room, furnished with rocking chairs, toddler toys, and a changing table, is available behind the sanctuary balcony. Large windows and speakers provide access to the service.